We are delighted to invite all members and employers, who are part of the Wiltshire Pension Fund, to attend our annual Conference held on 14th November 2018 at St John's Conference Centre in Trowbridge. 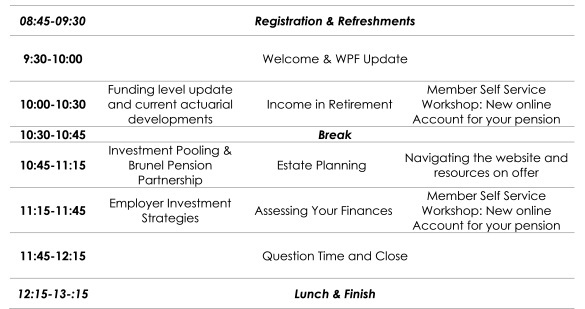 The Conference will cover how the Fund has performed over the last year and you also have the option to attend seminars in relation to personal Financial Planning, Digital Developments and Funding & Investments. Please note that spaces are filling quickly, so book in advance to avoid disappointment.